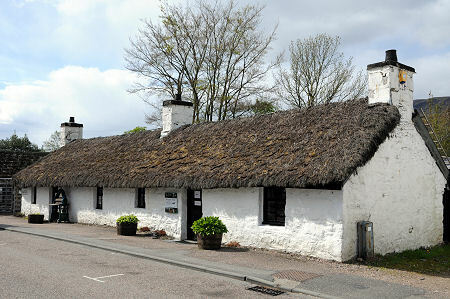 The Glencoe and North Lorn Folk Museum occupies what started life as two thatched croft houses in the 1700s. It stands on the north side Glencoe's main street and extends rather beyond the croft houses themselves, as you discover when you begin to explore the knot of additional buildings to the rear of the main museum. 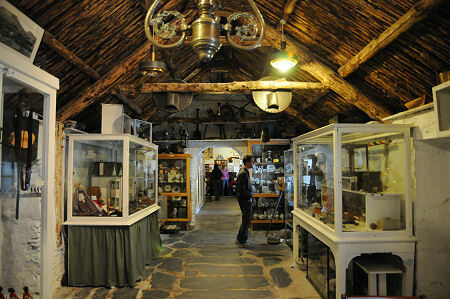 This excellent little museum has to be considered a "must see" for visitors to Glencoe. It is also one of only a few wet weather attractions in the area! 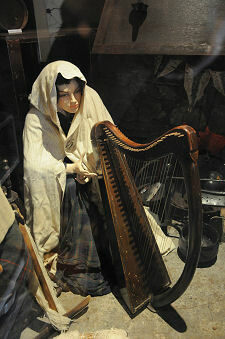 The origins of the museum date back to 1966, when two local ladies, Miss Barbara Fairweather MBE, and Mrs Rae Grant, set out to "collect, preserve and exhibit articles, costume, objects and information, relevant to the history and social conditions of the Glencoe and North Lorn district for the purposes of education and interest". It is arguable that one of the museum's main attractions is the remarkable (though once commonplace) building in which it is housed. Mrs Rae Grant, who is now in her eighties and still involved in the museum, helped secure the thatched croft houses for future generation to enjoy by physically standing in front of a bulldozer tasked with demolishing them. We can all be grateful that she succeeded, and the bulldozer did not. You enter via one of the doors letting in from the pavement. It pays to take heed of the warning here, and on other doors in the museum, about a lack of headroom. A combination of very low doorways and the very thick walls common to buildings of this type means that even the shorter than average amongst us are unlikely to emerge without having banged their heads at least once. Once inside you find yourself in a single long space running the length of the museum's street frontage, albeit with an arched division showing where one croft house originally ended and the other began. If there is a single word which could sum up the experience of visiting the museum, it is "atmospheric". There are no ceilings, and what you find above your head is a fully exposed roof structure supporting the inner side of the thatched roof. It is, incidentally, worth taking a close look at the exterior of the roof, which can be seen particularly well at the rear of the museum, to get a sense of the way these structures were put together using very locally sourced materials. There are a series of displays on view within the main museum. Some of the exhibitions are permanent, while others are more temporary. This means that some of what we describe below may not be on view when you visit: but it also means that there is always something fresh to keep repeat visitors interested. Many of the objects on view in the main area are housed in a series of glass cases, painted white to make the most of the available light. One case is home to a collection of historical children's toys, with everything from an imposing dolls' house to model trains, cars and traction engines. Elsewhere is a model of Ballachulish Station, once connected by rail along the coast to Connel and Oban. In complete contrast is a fascinating collection of swords and other weapons. When the government was viciously suppressing Jacobite sympathisers (or anyone who might possibly be a Jacobite sympathiser) in the aftermath of the 1745 uprising, a popular hiding place for the weapons whose ownership was now prohibited was within the thatching of buildings like the ones housing the museum. Sometimes the weapons were recovered by their owners at the time, but sometimes they were not. Many of those on view in the museum turned up in the roofs of local buildings as long as two centuries after they were originally hidden. There are a series of themed exhibitions in the buildings to the rear of the main museum. The "Massacre Room" reflects on the most infamous moment in local history, the Glencoe Massacre, when 130 government troops turned on their hosts, the Glen Coe MacDonalds, and killed many of them. Within the room is a recreation of a typical croft on the eve of the massacre, 12 February 1692. Elsewhere there are displays given over to the area's slate mining industry, whose traces can still be seen on the ground today. 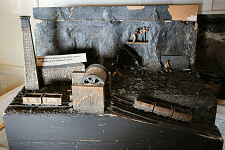 There is an excellent model of the Ballachulish Slate Quarry, together with a rather uncomfortable looking "penny for the Guy" figure kitted out as a slate dresser. Easy to overlook are exhibits relating to the area's natural history, including a case of birds, and a number of agricultural implements and machines. One display when we visited recreated the surgery of Dr Lachlan Grant of Ballachulish, now recognised as a pioneer in health care in the very early 1900s. Perhaps the last area most visitors reach is a lean-to against the rear wall of the main museum which is used to house a wide variety of everyday objects very roughly from the "50-100" year old era: ranging from mangles to butter churns, plus a large collection of clothes irons. Main Street, Glencoe, PH49 4HS.